striking was great but being the fashion guru that I am the first thing I noticed were the outfits, specifically the shoes. 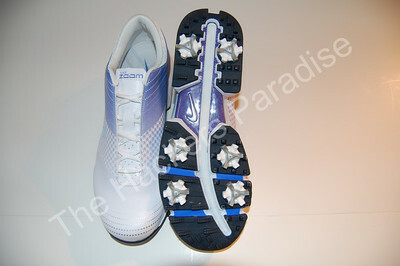 That was my first time seeing the new Nike Air Zoom Vapor Ladies Golf shoes and I was very impressed. Suzann’s entire outfit was great but her shoes really pulled everything together. When I found out we were going to have the opportunity to review these new men’s and women’s golf shoes I couldn’t wait. I can read technical stuff all day long but it means nothing to me unless I get to try it out for myself. With that said I took these beautiful babies for a joy ride from golf course to golf course, round after round, to see just how well they could hold up. I am very pleased to report that the Nike Air Zoom Vapors passed all tests will flying colors (and oh what pretty colors they are). My feet never hurt, my swing never suffered, and rain or shine the ground was no match for these shoes. 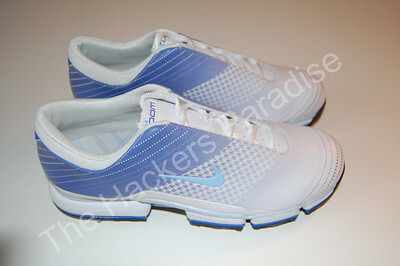 The price tag of $176.00 USD is a bit steep but I would still gladly purchase the ladies Nike Air Zoom Vapor golf shoes, because I know they can withstand the test of time and will be in my golf closet for many years to come. Now that we have covered the ladies shoes let’s talk about the mens. Since my feet were a bit too small for the men’s size 11 we had a fellow THP staff writer test the mens pair. There was no purple in these shoes instead the mens were a simple, yet still very stylish, black and white. These were also more of the sneaker-like shoe. Our male reviewer actually referred to them as a ‘hybrid’ golf shoe because as mentioned earlier they are not a saddle shoe but also not exactly a sneaker. On looks alone the men’s Nike Air Zoom Vapors definitely delivered. The heel is all black which fades into a lighter black, almost gray color, and then to all white with the famous Nike Swoosh in black. Our male reviewer is not normally a sneaker guy, in fact he doesn’t own a single pair of sneaker-like golf shoes, until now. He said that when he first saw them he was not overly impressed but once he put them on he couldn’t believe how sleek they looked. Again, THP was impressed with the look but that means nothing if they don’t feel good on your feet, so we had him put these shoes through the wringer. I got the report back from him after several rounds at different courses and the results were very similar to mine. He said that he played a lot of rounds in the early morning when the grass was quite wet and covered in morning dew and he said he felt these shoes had great traction no matter how soggy the conditions were. He also said that he was extremely impressed with how easily they came clean. I was told when he normally tries to clean his white shoes the dirt just smears around, but with the Nike Air Zoom Vapor the dirt came right off with a wet rag. He also said they were the most comfortable golf shoe he has worn to date. After 18 holes the first thing he does is change out of his golf shoes because his feet are tired and throbbing. With the Nike’s he said he didn’t have to change shoes, and instead he went straight to the club for some food and drinks with the fellas. My final question to him was at a price of $176.00 USD would you go out and purchase these shoes. Without hesitation his answer was yes. We both agree $176.00 USD is a lot of money for a golf show, however, for a premium shoe with style, stability, and extreme comfort it is well worth it. The Nike Vapor’s are different than anything else that we have come across recently and certainly will be a welcome addition to our closets. These are not traditional saddle shoes and because of that, some might shy away. If you are in the market for a high end shoe specializing in extreme comfort with a different look, these should be at or near the top of your list. 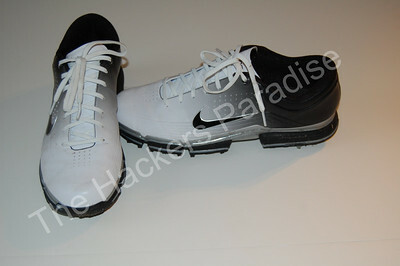 For more information on these shoes or any other Nike Golf products check them out at Nike Golf. Very thorough coverage. At first I did not like the look at all, but after the picture of the player wearing them, I am sold. Great read. I am not sure if these are for me because of the sneaker look but they sound great. I think the store near me plans on carrying them and I will check them out. I love the mens ones. Half shoe half sneaker…Like a unicorn. I have been waiting for these since i saw the pictures from the show. Great coverage. I want those mens ones bad. Release date? Very cool. How many colors do they have for women? I would love red white and blue? 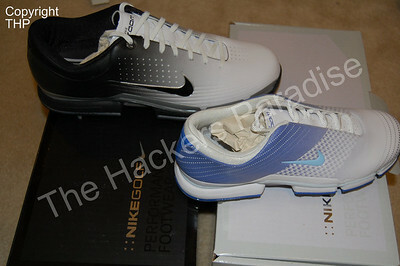 Just to clarify MSRP is $176 USD but street price is $139.99 and these great shoes were released February 1st, 2009. Men’s shoes come in Black/Yellow, White/Blue, and Black and White. Women’s shoes come in Black/Watermelon-White, Purple Slate/Ice Blue-White (these are the ones in the photo above), and Light Taupe/Birch-White. Susanne P. does look rather striking in them, doesn’t she? Thanks for the review, GG. Shoes are on the shortlist for purchases this season; now I suppose I’ll have to make sure I try these before I buy. I might have to work these into my shoe rotation. They seem like a great walking shoe. 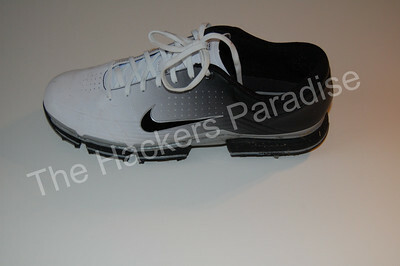 kers Paradise − Nike Air Zoom Vapor Golf Shoe Review? Seriously? I was searching Google for birch valley golf course and found this… will have to think about it.